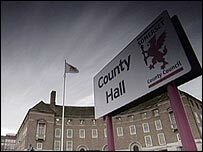 The government has rejected Somerset County Council's plans for a single unitary authority in the area. An announcement from the Department for Communities and Local Government on Wednesday makes the decision clear. Councillor Ross Henley, Leader of Taunton Deane Borough Council said, "The government has listened to the voice of the people." In a recent poll almost half the county's population voted, with 82% against the plan and 18% in favour. The turnout was estimated at 200,000. The poll, which was not a referendum, was managed by the Electoral Reform Services. Leaders and chief executives will meet to discuss the decision and how to progress their plans for shared services and improving two-tier local government. "I am delighted that the government has listened to the people of Somerset and their message that one huge council for was not for them," said Councillor Harvey Siggs, leader of Mendip District Council.